In a joint statement released with the NFL Players Association, the league cited "a failure in the application of the protocol" after a play in which Wilson was hit during the third quarter against the Cardinals. The Seahawks were fined $100,000 Thursday by the NFL over how they handled the league’s concussion protocol with quarterback Russell Wilson during a game at Arizona on Nov. 9. In a joint statement released with the NFL Players Association on Thursday, the league cited “a failure in the application of the protocol” after a play in which Wilson was hit on the chin during the third quarter against the Cardinals. Wilson left for one play and then returned, which raised questions as to whether the team had properly followed the protocol. In their own statement released after news of the fine was revealed, the Seahawks pointed to confusion about why Wilson was heading to the sideline as the reason for why the protocol may not have been followed as the NFL rules dictate. The Seahawks became the first team to be fined by the NFL for not following the in-game protocol. “The NFL and NFLPA have jointly reviewed the application of the Concussion Protocol to Russell Wilson. 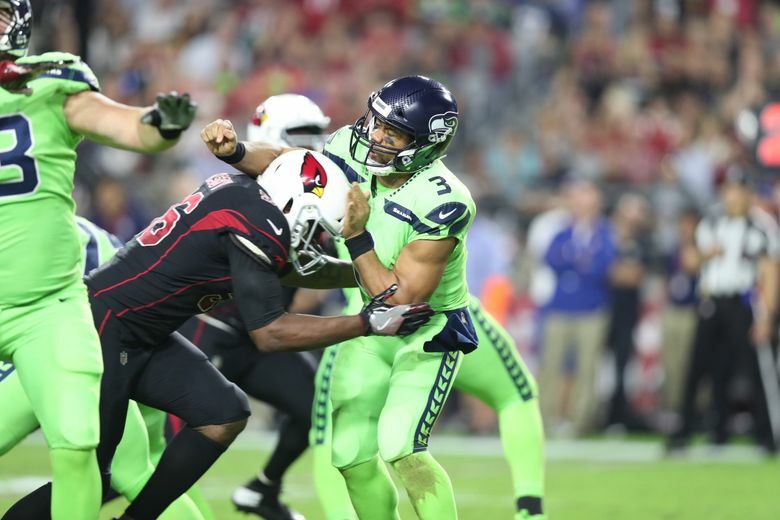 The results of the joint review determined there was a failure in the application of the protocol following the tackle of Mr. Wilson during the Seahawks-Cardinals game on November 9. As a result, Seattle has been fined $100,000 and the coaching and medical staffs will be required to attend remedial training regarding the protocol. The results of the joint review determined that the protocol was triggered when Mr. Wilson was directed to the sideline for an evaluation after the referee, Walt Anderson, concluded that a medical examination was warranted. Nonetheless, the required evaluation was not conducted and Mr. Wilson was permitted to return to the game without an evaluation. Once it is determined that a medical examination is warranted, a player may only be cleared to return by the medical staff; Mr. Wilson’s return to the field without a sideline concussion evaluation was therefore in violation of the Concussion Protocol. Subsequently the team medical staff did examine the player and clear him per the protocol. The Seahawks later released a statement saying they accepted the findings of the league but disputing that anyone had intentionally tried to skirt the rules. “There was a lot of confusion. I didn’t really understand why I was coming out of the game anyway, I was completely clear. My jaw was a little messed up, but other than that, that’s what they decided,” Wilson said. Wilson’s sentiments Thursday aligned with what he said after the game, when he insisted he was fine other than an injury in which he had to have his jaw realigned and had to stay to a liquid diet for a few days. He said he passed concussion tests on the sideline following the series in which he was hurt. Wilson was hit hard in the chin by Arizona’s Karlos Dansby, who drew a penalty for roughing the passer and was later fined $18,231. Wilson came out for one play, then returned for two plays, and then said he underwent all the needed tests on the sideline after the Seahawks punted and Arizona ran its following series. It is the fourth significant penalty levied by the NFL against the Seahawks in the last five years. Seattle was also fined $400,000 and had to forfeit a fifth-round pick in 2017 for violating rules regarding excessive contact in offseason practices in 2016. Seattle also had to forfeit two of three mini-camp practices in 2015 after the league determined that a practice that included a fight between Richard Sherman and Phil Bates violated rules for mini-camp practices. And the Seahawks also had to forfeit two OTAs in 2012 for a violation of workout rules. Seattle Times staff reporter Stefanie Loh contributed to this report.